BIFF Youth Pavilion = Awesome Film/Arts Programming For Kids and Teens! The Boulder International Film Festival brings world class film and events to Boulder for a short time each year. In 2016 their Youth Pavilion is offering kid and teen focused films as well as workshops such as how to creating zombie makeup. All programs are free on a first come, first served basis. BIFF is March 4-6, 2016 so make your plans now! 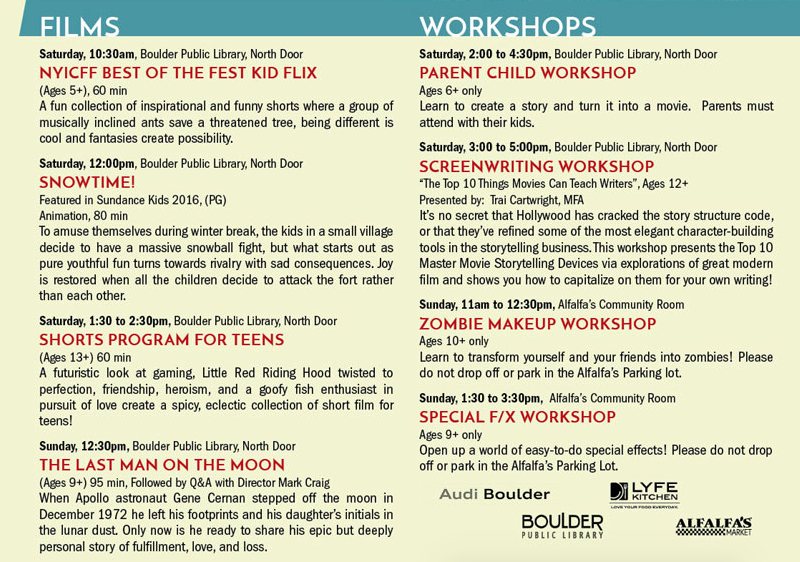 This entry was posted in Events, Families, Uncategorized and tagged 2016, BIFF, Boulder, Boulder International Film Series, Colorado, Education, Families, Kids, March, teens, Youth by Boulder Families. Bookmark the permalink.